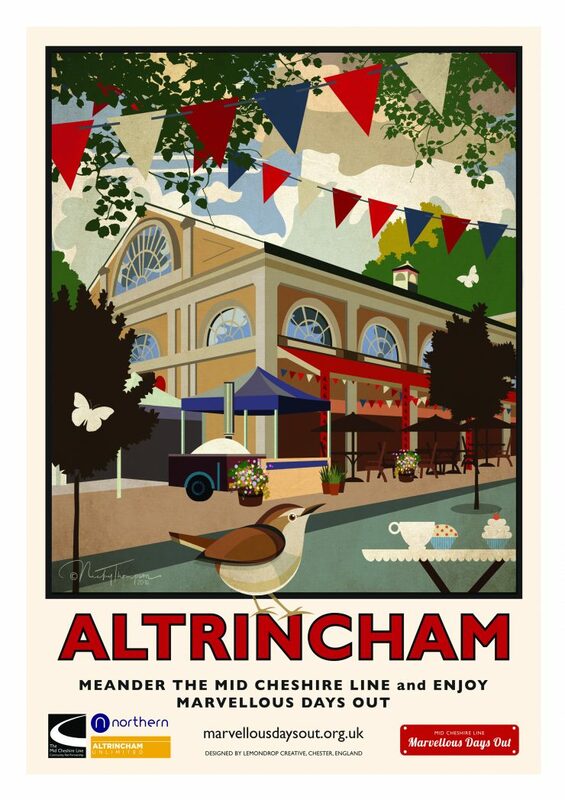 “Altrincham has something for everyone and a warm welcome for all its visitors. Your station for Altrincham is now called Altrincham Interchange as it not only serves the Mid Cheshire Line but is the Metrolink station for services to Bury and the Etihad Campus. It is also a bus interchange with local services and routes out to Manchester Airport, the Trafford Centre, Lymm, Warrington and other destinations. My memories of Altrincham are of the green Altrincham Electrics that served Manchester London Road Station – now Manchester Piccadilly. I also remember the electrics’ carriage depot on the site of the old Bowdon Station in Lloyd Street – built in 1849 but closed in 1881 when the present station was opened. If you live on locally, you probably recall using the train to visit the old Altrincham Ice Rink in Devonshire Road. Since 2007, Altrincham Silver Blades has been our local Ice Rink and is certainly worth a visit with its full-size ice pad, 2 cafes and licenced bar especially as it is less than a 5-minute walk from the station. You have got to visit the superb Altrincham Market and Market House as it is only a five-minute walk across the road from Altrincham Interchange. When we visited, we were lured into the traditional covered market by the aroma of the fresh fish counter with the artisan bread maker and cheesemonger having just what we were looking for. Is it surprising that the market was named Best Market 2015 by the Observer Food Monthly? Over the last couple of years, with the success of its popular festivals including the Goose Green Festival and the Food and Drink Fortnight, Altrincham has become a foodie hot spot. We took the train for the Altrincham Tapas Trail. It made us realise how many good fine eating places there were close to the railway station on Stamford New Road, Goose Green and around the new Market Square. Your choice of food was Altrincham Unlimited. It was a tasting trip of some of the best cuisines from all over the world. There was Japanese fried chicken, Italian meat balls, Spanish tortillas, Andalusian fried squid and Lebanese kebabs to name a few. Not forgetting, for those that know Altrincham of old, the locals’ favourite fish and chip shop opposite the market. Next stop on the train perhaps, the Be heALThy Here program to lose some pounds!